There is a tendency in dis­cus­sions of staffing and org­ani­za­tional structure to speak of people, especially soft­ware en­gi­neers, as being fun­gible—or not. What an ex­ceedingly unpleasant choice of words! People are not fungible. People fungibility is an inappropriate concept. Let’s see how the un­der­pin­ning issues can be dis­cussed more fruit­ful­ly. Fungibility is an attribute of goods whose basic units of ex­change are interchangeable. It is especially applied to com­modities whose future options are traded in an open market. A one kilogram gold ingot is the equivalent of any other one kilogram gold ingot. A barrel of West Texas Inter­mediate crude oil is the same as another barrel of WTI crude. And one pork belly is worth another pork belly in such markets. Somehow, the term “fungibility” has come to be applied to people. This occurs es­pec­i­al­ly in the context of discussing agile org­ani­za­tions, lean start­ups and such. 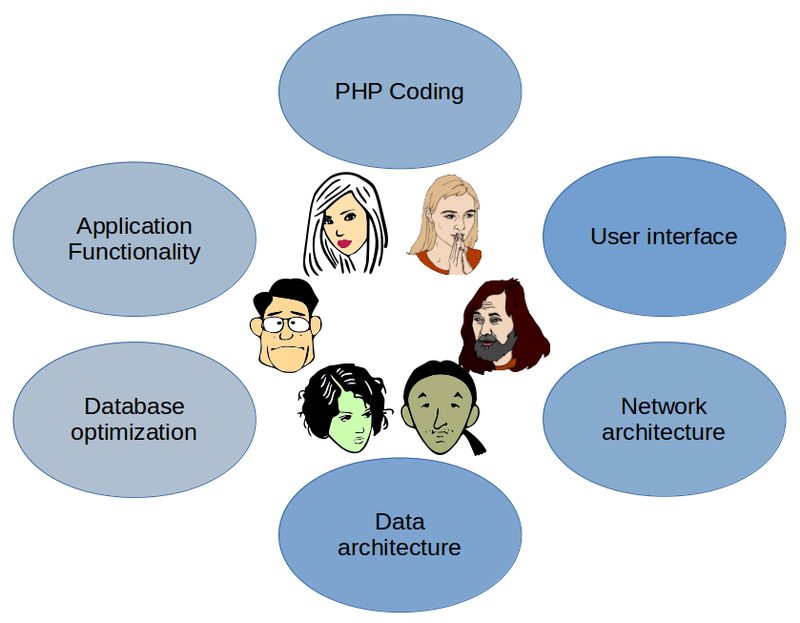 The fun­da­men­tal idea is that en­gi­neers should be multi-skilled, ver­sa­tile, with “full stack” ca­­pa­­bi­­li­­ties. This would allow them to play many dif­ferent roles in a product’s life cycle. Or, more to the point, an org­ani­za­tion would needs but a single role to manage products, when played by such people. People fun­gibi­lity is the opposite of spe­ciali­za­tion. Such people are not even “T-shaped”; they are “squares”. Fun­gibi­lity refers to the idea that any product engineer should be ex­change­able with any other product engineer, for a given type of product. But think of a square dance (see Fig. 1). In the course of the dance each participant dances with many partners. All partners per­form the same wide variety of steps and the costumes are often very similar. But we all have pre­fe­rences for our part­ners and dance better with some than with others. Fig. 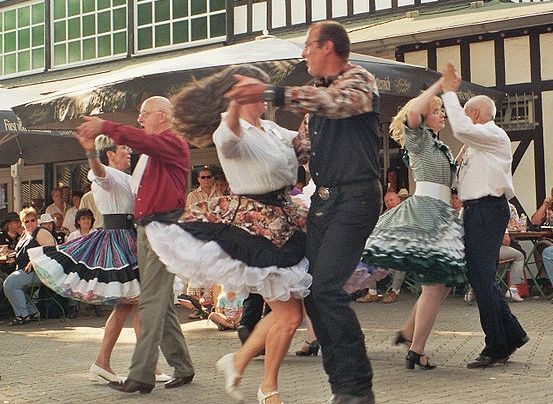 1: A square dance give the illusion of people fungibility. You change partners all the time and everyone performs the same steps, but every partner is very different. Aside from the extreme of­fen­sive­ness of implicitly comparing people, even en­gi­neers, to crude oil or pork bellies, fungibility is poorly chosen as a management concept. First of all, it com­pletely ignores the de­velop­mental stages through which all professionals go. To over­sim­pli­fy, there are people who are learning the ropes and need to work under direct su­per­vision. There are people who can work independently but their re­sults needs to be controlled. Some can work very reliably in an independent way. And there are people capable, in addition, of supervising, lead­ing and en­cour­ag­ing others. So, whereas fun­gi­bil­ity is an at­tri­bute of a static object, people constantly evolve along many different axes. What is more, the skills we need are constantly evolving. Con­se­quent­ly, each person may be in a different developmental phase with respect to each skill. 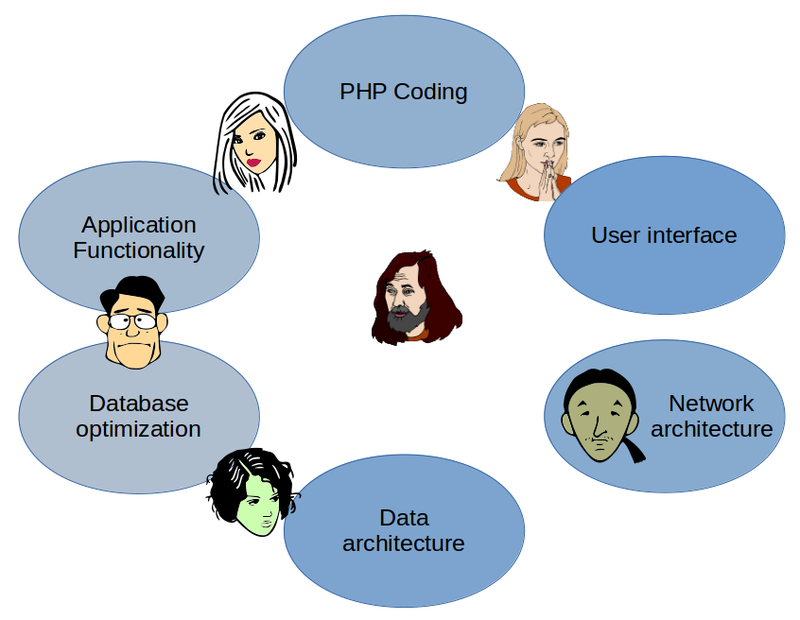 A person could be a brilliant C++ coder and, at the same time, a neophyte in R or Python. On top of that, organizations re­gu­lar­ly change the tech­no­lo­gies they use. So peoples’ skills re­gu­lar­ly change on a slippery slope of changing need. 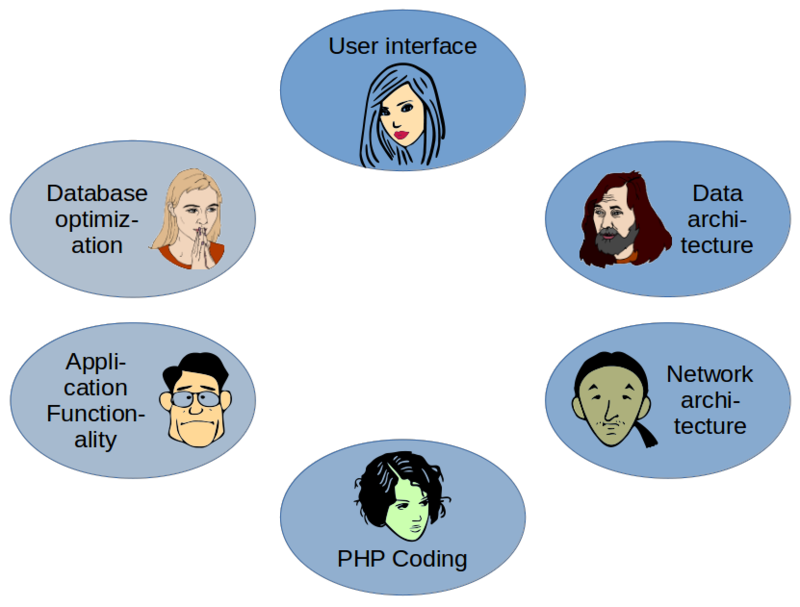 There are so many variables, so many chang­ing requirements and skills, so many aptitudes to acquiring new skills, that it is hard to imagine how we could ever call two engineers “fungible”. Whence Comes the Idea of People Fungibility? What are the roots of calling people “fungible”? One thread lead­ing to this ob­sce­nity is the idea of the “full-time equi­val­ent”. 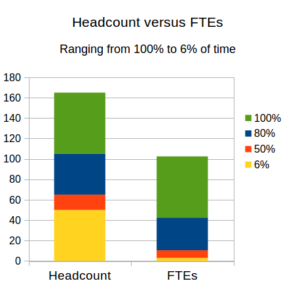 An FTE is a concept promulgated by hu­man re­source and fi­nance de­part­ments as a way of ma­nag­ing personnel in the ag­gre­gate (see Fig. 2). Another basis for the concept is the idea of professional qua­li­fi­ca­tions, at­tested to by a piece of paper stating that you have passed an examination, thereby de­mon­strating your professional qualifications. For some people, one Microsoft Cer­tified En­gi­neer is thought of as the equivalent of another Microsoft Certified Engineer. Anyone with a Cisco CCNP Cloud cer­ti­fi­ca­tion will do the trick, eh? Only hire help desk agents with ITIL Foundation cer­ti­f­icates.1 And so forth, thinks the manager who accepts the con­cept of people fungibility. But wait, you may say. Some­thing is wrong with that! These certifications are entirely the­o­re­ti­cal in nature. They show that you can pass an ex­a­mi­na­tion, that you can memorize a certain number of facts. But that is not the same as being an effective and efficient col­la­bo­rator in an organization. Just so. It is a problem to treat certifications as if they were hallmarks on ingots of gold. Another source of this concept is the idea of the perfectibility of work. 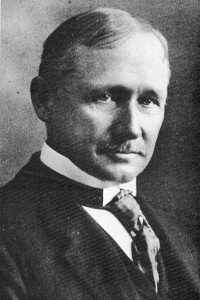 This con­cept owes much to the work of Fre­de­rick W. Taylor and his prin­ci­ples of sci­en­ti­fic ma­nage­­ment. The as­sump­tion is that there is a single best way of performing a certain type of work. A role of management is to discover this method and to ensure that all laborers do their work in that way. The result of achieving this goal is the fungibility of the people work­ing in a uniform way. I will come back to this issue below when I discuss robots and fungibility. People Fungibility or Resource Liquidity? Rather than simply pooh-poohing the whole idea of people fungibility, we should recognize that there are some important issues underlying it. A much better way of thinking about these issues is through the concept of “resource liquidity”. Resource liquidity, like fun­gi­bi­lity, is a term borrowed from eco­nomics. The liquidity of an asset is a measurement of how easily that asset can be converted into another type of asset. Thus, cash is extremely liquid. You can almost always use it to buy something else (so long as you have enough of it). Real estate tends to be illiquid. It might take a long time to find a buyer at a mutually agreeable price. In the context of people doing work, resource liquidity refers to the degree to which a person is available to perform a task when that task is ready to be per­formed. Liquidity can be measured as a percentage of cases, given a certain context. Thus, we might say that someone is available to test a solution when it is ready to be tested 80% of the time. Or we might go one step farther and define availability within a given range of time. Thus, some qualified person might be available to diagnose an incident within 10 minutes 90% of the time. This is the essence of pro­ba­bi­lis­tic ma­nage­ment, the idea that some predicted value will fall within a given range a certain percentage of the time. It contrasts with deterministic management, such as de­fin­ing a rule for the maximum time it must take to start performing a task. Note that we are not talking about the virtual “con­ver­sion” of one human resource into another human resource. We are instead talking about the conversion of the human potential to do work—the initial asset—into some type of useful transformation or assembly of the inputs to work, which results in an­other type of asset. When an organization is composed of highly spe­ci­alized personnel, it might happen that only one or very few people are qualified to perform a certain task. De­pending on the arrival cadences of those tasks, the durations of tasks and the acceptable waiting times, we can calculate how liquid those resources are. This is a typical example of an Erlang analysis. If we increase the number of people qualified to perform a task, which is what the concept of human fungibility is all about, then we increase resource liquidity. The obvious difference between people fungibility and resource liquidity is that the former is an all or nothing concept. Two people are either fungible or not. Statistically speaking, the data is of the categorical type. Fungibility leads to thinking of people in the aggregate. Li­qui­dity, on the other hand, is measurable along a con­tinu­ous scale. In statistics, it is nu­me­ri­cal data. As we saw above, fungibility refers to static, intrinsic pro­per­ties, whereas liquidity refers to behavior within col­la­bo­ra­tion and the flow of work. Liquidity encourages us to think of people as individuals. When we ad­dress people problems in terms of how in­di­vi­duals work together, we can start asking the ques­tions that lead to durable im­prove­ments. Problems de­fined in the aggregate lead to solutions meant change ag­gre­gate statistics. She helped Jack with some personal issues to ensure that he was getting enough sleep, thereby mak­ing him a better colleague to his team­mates. In short, thinking of people in terms of fungibility makes it easier to measure them. It is conceptually easier for cog­ni­tive­ly challenged ma­na­gers to think in such terms. Then again, it is easy to measure people as being either “smart” or “dumb”, but that does not make such a dehumanizing ca­te­gor­i­za­tion ei­ther e­co­no­mi­cal­ly useful or morally right. The concept of fungibility plays a role in the current debate about the respective roles of people and robots. In this case, however, people are concerned about their re­place­ability by robots rather than by fungible, human colleagues. Some might object that people performing highly standardized manual tasks should be treated as fungibles. One may take pride in such work and excel in its performance. I do not mean to disrespect people who per­form such work. In economies with low levels of capital­i­za­tion, many such roles might exist. 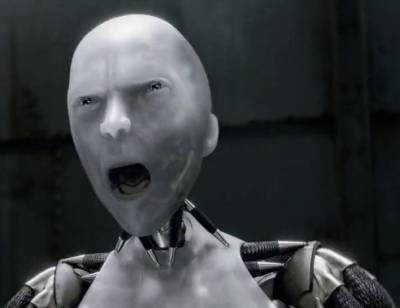 However, in economies with high capitalization, such roles tend to be performed by robots. If not, they are likely to be so performed in the near future. Thus, the more work can be performed by a fungible agent, the more it is susceptible to being per­formed by a robot. Fungibility is a factor dis­tin­guish­ing people from robots. Two robots coming off the same assembly line are fungible. But, with the rise of robots using machine learn­ing, do we not have more and more robots that are distinct, one from the other? As an individual robot goes through multiple iterations of learn­ing, does it not develop unique, non-fungible at­tri­butes? Some might even speak of robots having their own per­son­alities. While this might be true, it points out that the concept of fungibility for software cannot be the same as fungibility for hardware. If two ingots of gold are fungible, it is because they share the same intrinsic qualities that make gold ingots e­co­nom­i­cal­ly valuable. Two robots, with different machine learning ex­pe­ri­ence, are in­trin­si­cal­ly dif­fer­ent, so how can they be fungible? The answer is that robot experience is realized in software—data and al­go­rithms that can be easily copied from one robot to another. Once so copied, the robots become highly fun­gible. This distinguishes robots from people. It is extremely difficult to reproduce in a second person the learning that one person has acquired. Indeed, making a car­bon copy of one person’s learning is undesirable. It is more bene­ficial to allow each person to bring together their different experiences and learn­ing so as to encourage new per­spec­tives and innovation. We may close this discussion by referring to the issue of diversity in teams. Is it conceivable that team mem­bers be fungible and, at the same time, be diverse? To what sort of diversity am I referring? The past few de­cades have seen extensive research by so­ci­o­log­ists and psychologists into the im­pact of team diversity on the performance of work. Many of these studies concern diversity on the basis of skill sets, race, gender, social ca­te­gories, values, experience and so forth. The results of the studies are hardly uniform and are difficult to reproduce. It is difficult to make generalizations about the impact of diversity on a team’s per­for­mance. That being said, cases have been identified where a mixture of senior, experienced people with neophytes give better results than teams composed of “experts” alone. Similarly, cases where teams combines fun­da­men­tal­ly different jobs, such as architects, marketers, de­sign­ers, artists and en­gineers, have shown im­prove­ments in per­for­mance. So, should we aim at making people more similar to each other, making them as in­ter­change­able as possible, or should we aim at improving how dissimilar people collaborate? The obvious answer is that we should find ways of making our resources more liquid and ways to improve col­la­bor­a­tion. But these are only attempts at strategies for achieving our real goals, and should not be goals in and of themselves. The real goals are for workers to find pleasure and fulfillment in doing work, for that work to deliver its results when its customers need them and for the work to be done efficiently and effectively. The article People are not fungible by Robert S. Falkowitz, including all its contents, is licensed under a Creative Commons Attribution-NonCommercial-ShareAlike 4.0 International License. [a] Jehn, Karen A., Gregory B. Northcraft, Margaret A. Neale, “Why Differences Make a Difference: A Field Study of Diversity, Conflict and Performance in Workgroups” Administrative Science Quarterly 44/4 (1999). [c] Pelled, L. H., “Demographic diversity, conflict, and work group outcomes: An intervening process theory” Organization Science, 7 (1996) 615-631. [d] Watson, W. E., K. Kumar, and L. K. Michaelsen, “Cultural diversity’s impact on interaction process and performance: Comparing homogeneous and diverse task groups.” Academy of Management Journal, 36/3 (1993) 590-602. [e] Williams, K. Y. and C. A. O’Reilly, “Demography and diversity in organizations: A review of 40 years of research.” Organizational Behavior 20 (1998) 77-140. 1 A recent report (unfortunately made unavailable on 2019.03.12 and not archived ) gives an incoherent view of how the respondents feel about certifications for help desk agents. Two-thirds of the respondent felt that ITIL qualifications have some value. On the other hand, only 7% of the respondents felt that something was more important than professional certifications for hiring and promotion. Whatever that might be was not clearly revealed. Unless otherwise indicated here, the diagrams are the work of the author. Figs. 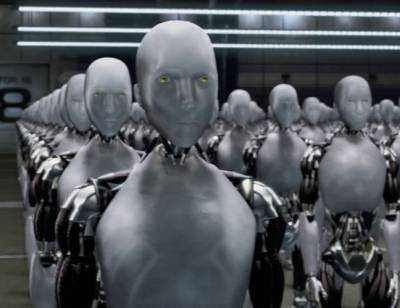 7 & 8: Images from “I, Robot” 2004. Copyright Twentieth Century Fox Film Corporation. Why is describing people as fungible offensive and inaccurate? What is meant by people fungibility? How does fungibility relate to performance and diversity? Is resource liquidity a better way of measuring the issues of having the right resources at the right time and place? 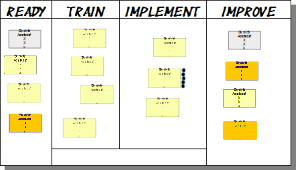 Excellent article and contribution to the Lean Kanban community Robert — thank you! This is a very important topic, and it might be useful to bring these parameters into appraisal of an organization’s Kanban maturity. That’s a good point about the issue of maturity, Minton. On the one hand, I think it straight-forward that high resource liquidity is a sign of maturity. It’s not clear to me, though, how the gradient of specialization or “fungibility” might relate to maturity. If we look at this from a static point of view, then we might say that there is no single configuration of skills that is best for all cases. But if we look at it from a dynamic point of view, whether organizations need to invest in personal development over the long term, then the aspect of maturity becomes clearer. In other words, can we say that an organization that only looks at the current situation and chooses its resources based on what was needed yesterday is less mature than the organization that has attempted to plan for future needs by developing “square-shaped” people? Maybe, but at the cost of being less agile. And this in a realm where skill needs evolve terribly rapidly.